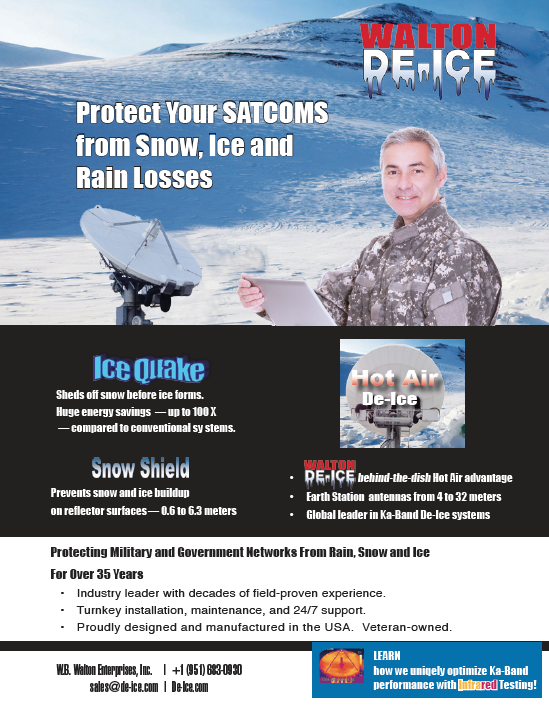 Satellite interference mitigation techniques for satellite operators that support them in ensuring high service levels of quality for their customers is absolutely crucial to their success. A number of articles have already been written describing the thread of interference for the whole industry, especially when discussing intentional interference as we can see that occurring more frequently now in the MENA area. 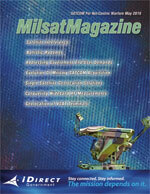 I have already described available satellite interference mitigation solutions in the February issue of SatMagazine—see http://www.satmagazine.com/story.php?number=2053626099. This article focuses on available techniques for a geolocation system working with a single satellite. The main drawback of the most frequently used geolocation technique is the necessity of having at least two satellites close enough to each other to ensure useful crosstalk energy on the adjacent satellite for the interference calculations. Even though several hundred GSO satellites (and only this type of satellite is currently used by geolocation systems) are in operation from the main satellite operators, some of them are still “isolated,” meaning that the next adjacent satellite has more than 10 degrees of separation. In this case, the crosstalk is quite likely too small to be measurable. Should an adjacent satellite be available, that does not necessarily mean that the satellite can be used for geolocation. One of the main parameters which need to be known by geolocation systems is the exact position and velocity of the satellite (for both the main and the adjacent satellite). These parameters are called satellite ephemeris data, which have a significant impact on the accuracy of geolocation systems. In case the adjacent satellite is from a different satellite operator, such ephemeris data are often not known, or only with minimal accuracy—that makes geolocation useless. With the help of tracking systems, the ephemeris data could be calculated from satellites, even though no such data are available. However, one of the preconditions of successful tracking is the availability of enough reference stations. A reference station is a known uplink station in terms of its localization (Latitude. Longitude), which transmits a known (reference) signal to the satellite to be tracked. 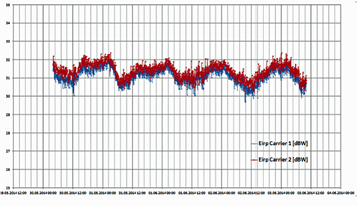 There have to be at least five to six reference stations in order to calculate the ephemeris data with sufficient accuracy. That may sound easy but means, in reality, a real challenge and is often quite impossible to achieve. The reason is that the operators often do not know from which station which signal is being transmitted. Power variations caused by weather effects. Should you be lucky enough to have an adjacent satellite available close enough to the affected satellite, and you also know the precise ephemeris data, the next hurdle is that the crosstalk on the adjacent satellite needs to be in the same frequency area and polarization as the interference signal on the main (affected) satellite. Taking all of this into account, well, you can imagine that there are a lot of scenarios where geolocation is impossible with the current available tools and algorithms. Therefore, it would be a big advantage to have a geolocation system available and working as intended by just receiving the interference signal via a single satellite. Section 5.1.2.8 of the 2011 ITU Handbook of spectrum monitoring describes a possible method for geolocation of an unauthorized transmitter on Earth through the use of a single satellite. The drawback of this approach is the sensitivity to frequency variations caused by the uplink station HW itself (e.g., frequency sources and PLL equipment being affected by temperature variations, and so on) which easily can reach—or even exceed—the influence of the Doppler shift. In fact, geolocation systems on the market that use this method have shown reachable accuracy is beyond 100 km and, therefore, not really useful to identify the uplink station of an unauthorized transmitter. They may work with acceptable accuracy when the interference signal is received via an inclined orbit satellite, which shows greater movements compared to regular satellites, resulting in a bigger Doppler shift. The technique relies on the power of a satellite signal, transmitted from a certain uplink station on Earth to the satellite and down to a receiving station. The power varies with time due to a number of factors that include movement of the satellite, atmospheric and weather conditions (on the uplink and downlink side) and changes in power amplifier gain and antenna alignment at the uplink station as shown in the Figure 1 on the next page. The assumption is that signals transmitted from the same uplink station, or the same geographical area, reveal the same power variations in the same time frame, whereas signals transmitted from different geographical areas will show different power variations in the same time frame. The following example in Figure 2 on the next page shows the power variations of two signals (red and blue) transmitted form the same uplink station over a period of four days. A 24 hour variation coming from the satellite's movement can be clearly identified. Figure 3 shows an example of power variations caused by weather effects (large spikes). In both cases, the power variations are more or less identical as both signals are transmitted from the same uplink antenna. In order to locate the transmit station of an interfering signal, the similarities of the interfering signal with other known signals must be calculated. This is usually done in the frequency domain by correlating the signals or parts of them—therefore, the correlation algorithm is most crucial to Geo-localize the interferer in terms of accuracy, efficiency and success. This concept is applicable in case a number of different signals are transmitted from the same uplink station or in the same geographical area as the interference signal. 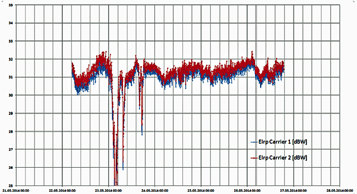 All signals (including the interferer) are permanently monitored by the SIECAMS carrier monitoring system (CMS). Any change of the interfering signal in power, frequency or bandwidth (e.g., forced by weather influences) must have an attempt at correlation with the measurements of other investigated signals. 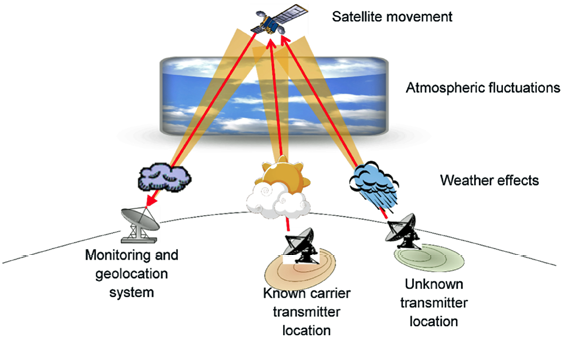 In case of a positive correlation caused by such elements as weather influence, HW dependencies, and so on, the assumption is that the uplink location of the interference signal is identical, or close, to the uplink location of the known carrier. The challenge in this method lies in the correlation approach as the measurements are typically not performed at exactly the same time, depending on the monitoring strategy (e.g., round robin). This influence is supposed to significantly affect the correlation result requiring relevant measures (time delta depending weighting, plausibility checks, ambiguity mitigation, etc.) to be investigated. Furthermore, the method could be enhanced in terms of taking into account additional information, such as HW related information belonging to the known transmit stations, third party weather information, etc. Weather information could be used for additional ambiguity mitigation in terms of identifying/eliminating cases which are in conflict with certain weather situations. Figure 4 on the following page is a screenshot of the latest version of SIECAMS ILS ONE which shows a screenshot of the map displaying the results of a successful localization. Depending on the similarity of a known signal (known position of the transmit station) with the interference signal, the system draws circles with different diameters to indicate the likely position of the uplink station of the interference signal. 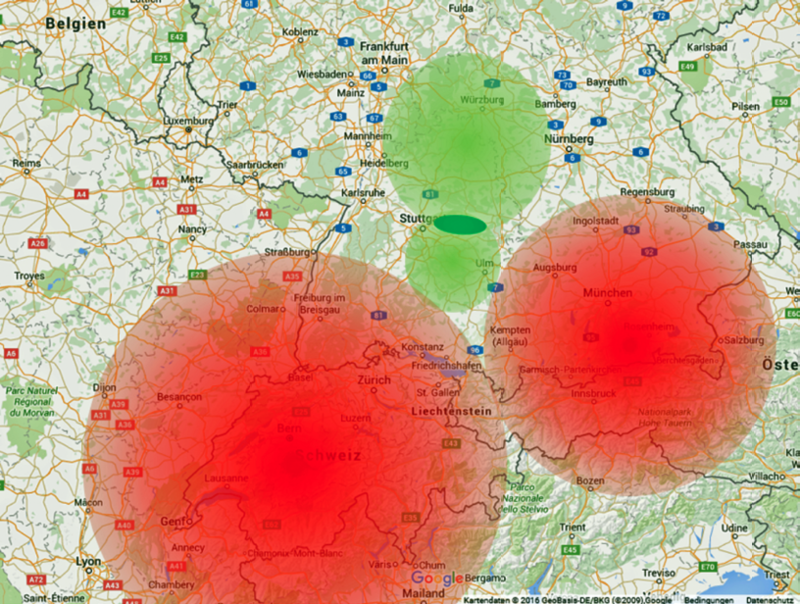 Red circles are indicative of areas where the interference signal does not originate (excluding areas), whereas green circles are more promising areas for the uplink station of the interference signal. The more that known carriers can be measured, additional circles are drawn and a more accurate result will be obtained. The above described method is already in operational use—please see press release http://www.convergence-creators.siemens.com/eutelsat-siecams-ils-one-satellite-geolocation.html. This system could successfully localize some of the interference cases which can not be resolved by the traditional two satellite geolocation system. Compared to the traditional geolocation technique using two adjacent satellites, this method does not need any ephemeris data of the satellite, nor any reference carrier with a known uplink position. Especially for Ka-band satellites or military satellites working in X-band, this solution might be the only possibility to perform a geolocation measurement and get rid of any kind of interference. Erwin is Sales and Product Line Manager for the Siemens CVC (Siemens Convergence Creators GmbH) Satellite Communication and Monitoring Solutions. Thus he is responsible for the definition of products for monitoring and troubleshooting the quality of satellite communication systems, product marketing, technical and commercial sales activities. Prior to joining the Siemens Space Business, Erwin was section head for Broadband Management Systems and Fast Internet Solutions. This business sector handled projects in the area of Cross Domain Management Systems especially for Broadband IP and ATM networks. He holds a degree in Electrical Engineering from the Federal Secondary College of Engineering in Vienna, Austria.